George Leing’s entry into politics didn’t come with a paycheck. The 57-year-old Chinese-American lawyer, born and raised in Queens, New York, had always been interested in government, so after moving to Colorado around 2007 with his wife Sarah and his son Thomas, Leing began attending local county meetings. He volunteered as a precinct committee person and later as a district captain, handing out flyers and making phone calls to Republicans to let them know what was happening with the party. 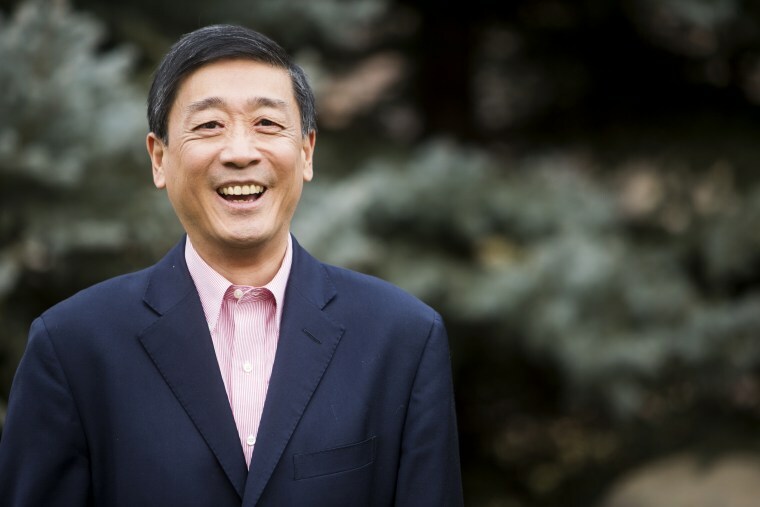 That collective experience took Leing, the son of immigrants from China, to the chairmanship of the Republican Party in Boulder County, a role he said he accepted around 2010 after the original title holder became ill. It also spurred him to run for Congress in 2014 and, a year later, to run to represent Colorado on the Republican National Committee, a position he was elected to this month. Leing replaces Mike Kopp, a former Colorado state senator who resigned to become an executive director of a bipartisan business organization. “It’s funny, you call it a political career, but it was never intended to be anything more than helping as a volunteer,” Leing, who will be part of the delegation sent to the Republican National Convention in July, told NBC News. With the presidential election less than a year away, Leing said he and fellow committee member Lily Nuñez are tasked with maintaining the workings of the party and helping to put together the convention, among other things. “It’s not a real glamorous role necessarily, but it’s important in just making sure that everything is set up for this process of nominating our candidate,” Leing said, also noting that committee members do not draw a salary. Unlike many states, which have primary elections to allow voters from both parties to choose candidates by secret ballot, Colorado is one of 10 that rely solely on caucuses, an open meeting for party members to decide which candidates to support and which delegates to send to the nominating convention. But after a rules change on the national level, Republican caucus-goers in Colorado will meet in March to begin the process of selecting only the delegates who will represent them at the convention in Cleveland, according to the Denver Post. This revision, which cancelled the presidential preference poll, allows Colorado’s 37 delegates — which will automatically include Lenig, Nuñez, and Colorado GOP state chair Steve House — to back any candidate they choose come July. Making sure the local precinct caucuses were held was one of Leing’s duties when he served as chairman of the Boulder County Republican Party some five years ago, he said. Having come from a state that holds a primary, Leing said that he enjoys the level of interaction at a Colorado caucus. "You get together with your neighbors and talk," he said. For Leing, who has a law degree from Georgetown and a master’s in religion from Yale, being open to listening to diverse points of view is a vital part of the political process. That was also his mindset when he ran for Colorado’s 2nd Congressional District last year, he said. Leing was up against a three-term Democratic incumbent named Jared Polis, who won with 56.7 percent of the vote to Leing’s 43.3 percent. But while Leing didn’t make it to the House of Representatives, his defeat was still a victory of sorts — he managed to garner the most votes nationwide for a losing congressional candidate in a largely Democratic district. RELATED: Is the GOP Losing the Asian-American Vote? Leing, who on the campaign trail championed fixing the Affordable Care Act and paying down the national debt, said he probably won’t be making another bid for Congress in 2016. His term as national committeeman ends after the convention and in April there will be an election to fill that post. As of now, Leing said he plans on running. "...you call it a political career, but it was never intended to be anything more than helping as a volunteer." The youngest of four children, Leing said he learned much from his father, an immigrant from Canton, in southern China, who came to the U.S. with his wife in 1947 to work at a Chinese-language newspaper and who later opened restaurants in Manhattan’s Chinatown. From his upbringing, Leing said he saw that there were no guarantees, that you make decisions and live with the outcomes. But he also saw there were always opportunities to retool and come up with new approaches, he added. RELATED: Can Texas Republicans Bring Asian America into GOP Tent? In Leing’s view, the GOP is a party for opportunity — the same opportunity his father so strongly believed in — and that is something Leing said should naturally resonate with all immigrants. But with Asian-American voters, in particular, the GOP has watched its support steadily wane since 1992, a year when some 55 percent of Asian Americans voted for Republican President George H.W. Bush, according to the Roper Center.